Thank you to Tricia at The Miss Rumphius Effect for hosting Poetry Friday this week. I don’t know about you, but my heart was saddened to hear the news of Mary Oliver’s passing today. One of my treasured gifts last June was FELICITY by Mary Oliver. A recorded interview about the book can be founded HERE. Besides the natural world that she has explored so often, in FELICITY Oliver explores the mysteries of the heart. the mountains, and the rivers. up at the blue space? …Rumi said, “There is no proof of the soul. Poems arrive ready to begin. Thank you, Mary Oliver, for transporting poems to the world all these years. You will be missed. Your voice will remain. Anastasia Suen visiting today. She is currently on the CYBILS Round One Poetry Panel and is quite busy so I’m glad she took time from her schedule to be interviewed. MsMac: What books are on your night stand? AS: The Renaissance Soul by Margaret Lobenstine and you are here by Thich Nhat Hanh. I also have a stack of books for my Booktalking blog, (including this year’s CYBILS poetry nominations). MsMac: What is your favorite reading spot? MsMac: What does a day of work look like for you? AS: I write in the morning and I teach in the afternoon. (I’ll be teaching the Naturally Creative Workshop again in January as well as the three kidlit writing workshops I offer year round: picture books, young nonfiction and children’s novels.) I always have a dozen or so projects in the works at one time, so no two days are alike. MsMac: What is your favorite time of day to write? AS: First thing in the morning is the best time to write. I write in longhand before I work on the computer, so my thoughts are free to go in any direction. MsMac: Writing the first draft or revising? Which is your favorite? AS: I like first drafts because that is what the big decisions are made. I need to take all of the research and thinking I’ve done and make it into something new. (Synthesis!) I find that very satisfying. I also like to revise because I keep coming up with new ideas as I write. I love it when that happens. MsMac: What does your writing space look like? AS: I have my old couch, a wall of bookshelves and four tables of varying sizes with stacks and piles of files from different projects. There are two filing cabinets in the room (and stacks of file boxes in the closet). I also have several whiteboards that I use to plan my books. MsMac: What are your current projects? AS: In addition to writing my own books, I also work as a freelance book editor and write two magazine columns. 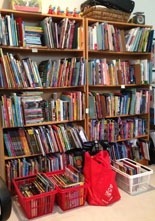 Focus on STEM is my Booklist column and Grow with STEM is the LibrarySparks column I write with science writer Shirley Duke. MsMac: What might readers find you doing when you’re not writing? MsMac: How has writing poetry informed you as a person? AS: I have been writing poetry since I was in elementary school. My mother played the radio all day when I was child, so we always had music in the background. A song expresses emotions and tells stories with concise vivid language. In my view, poetry is spoken music. It is a song with the human voice as its only instrument. MsMac: Why is poetry important? 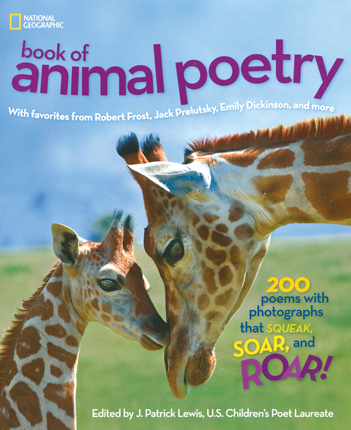 AS: Poetry is important because it focuses on one story or one emotion at a time. It doesn’t rattle on and on going here and there and everywhere. Instead, it concentrates on one thing and looks at it deeply. Poetry slows us down and asks us to think, to see the world in a new way. It gives us the gift of being present in this moment. This is especially true with haiku, and that is why I like it so much. It is a challenge to say something with so few words. You have to make every word, every syllable, count. MsMac: Dark chocolate or milk chocolate? MsMac: Dance: funky chicken or the tango? Please return Friday for an original haiku by Anastasia. 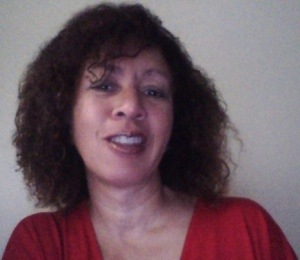 Late August an email appeared for a free SKYPE visit from Carole Boston Weatherford. She has been talking to students about the fiftieth anniversary of the 1963 Birmingham Sixteenth Street Baptist Church bombing. I though what a great opportunity for my fifth graders. It was a great visit two weeks ago. 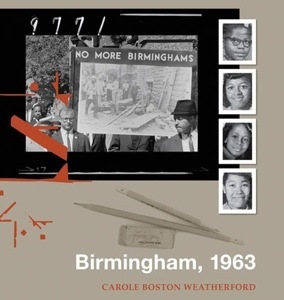 Have you read Birmingham, 1963? If not, you should. Today Carole is stopping by to share about her reading and writing life. MsMac: Where’s your favorite reading spot? CBW: In bed or in the passenger’s seat of a car or on a train. MsMac: What does a day of work look like for you? What is your favorite time of day to write? CBW: I like to write in the morning or afternoon. But if I’m grooving with a manuscript, I can keep writing until late at night. CBW:I like revising because I am able to see progress with each subsequent draft. CBW:It has two legs and a soft cushion and most often denim upholstery. It’s my lap. MsMac:What might readers find you doing when you’re not writing? CBW: Teaching. 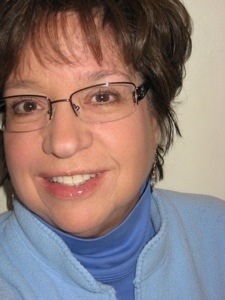 I am a college professor and teach children’s and adolescent literature and professional writing courses. In my spare time I like to travel and to visit museums, parks and historic sites. MsMac :You have been conducting SKYPE visits in remembrance of the fiftieth anniversary of the Birmingham church bombing. What has been the response from the students you have visited? CBW: They can’t believe that such hate violence occurred in the United States. They are appalled, and rightly so. MsMac: I would agree that was the feeling of my students. I kept wondering why they would ask the same question. Then I realized that it was their way to process and confirm such a horrific event. MsMac: As a child, how aware were you of the protests, the bombings, and the fight for civil rights? CBW: I saw news reports of protests such as the March on Washington and the aftermath of the assassination of the Reverend Martin Luther King, Jr. However, my parents shielded me from the news of the church bombings when they incident occurred. I was only seven years old at the time. CBW: Poetry sings to my soul. Sometimes, I think and feel in poetry. CBW: Poetry distills emotions and makes music with words. For children, poetry contributes to creating a language-rich environment so crucial to early literacy. MsMac: Me too. With nothing else. Be sure to stop in Friday as I will have a poem by Carole Boston Weatherford. Today, I am Interviewing Kelly Fineman, poet and CYBILS’ panelist for round one in poetry. Last year her poem ‘Sea Jelly’ was published in National Geographic’s Book of Animal Poetry, a CYBIL’s poetry finalist. KF: On the cheetah print chaise lounge in my living room, or on the leather sofa in my sweetheart’s living room, or on the deck at my house or the patio at his. But I love to read, and can read anywhere. KF: I am working hard to create habits so that I have a “typical” day of work, but it varies by day. Most days of the week, I start by reviewing emails and social media, then move into a before-lunch work session. At least three days a week, I have afternoon work sessions as well. On Tuesdays, I meet my friend and writing partner, Angela De Groot, at a local Panera’s for shared writing time, which is always inspirational and fun. My favorite time of day to write is probably the morning, although I am not an early starter. KF: Ooh – tough question. Writing the first draft is so satisfying, because it’s creating something out of nothing, but revising is also satisfying because it polishes what’s there, pares off the extraneous stuff, and adds in what’s missing. Both can be frustrating and triumphant, but I think the pleasure in getting something “right” means that revision wins out for me by a whisker. KF: I am in the midst of straddling two living spaces just now. At my house, I write sitting at my dining room table, because the area gets lots of natural light and has lovely views out the back sliding doors and front picture window. At my sweetheart’s house, I sometimes write in his current office, which has the benefit of a water fountain located just outside the window, which makes a lovely, soothing noise as I work, and sometimes in the living room, which has a gorgeous view of the back yard. MsMac: What is your current project? KF: I have just finished up revisions on a young adult poetry collection, and am working on a new collection of poems for middle graders. MsMac: Ooh, yound adult poetry, sounds interesting. What might readers find you doing when you’re not writing? KF: They might find me meditating or doing tai chi, or reading (of course! ), or baking or cooking. KF: Talk about a tough question! I can’t tell you for sure whether writing poetry makes me more aware of phrases, incidents or images that inspire new work, or vice versa, but I do know that I find inspiration all around me on a pretty regular basis. KF: I could probably write you a dissertation on this one. It’s important for children – and should be used far more widely in schools than it is – because the poetic devices used, whether it be rhyme or metre or alliteration or assonance or just the concrete imagery and excellent, specific word choice that is commonplace in poetry, help kids to process information in different ways. Rhyming, metrical poetry is processed in the same section of the brain as music, which allows some kids to process or memorize the information contained more easily. Poetry is important in general, though, because it allows people to process information free from the boundaries of precise logic, although precise language is usually involved. It allows a reader to experience an emotion or action vicariously, and through a far different lens than is available in other forms of writing. Startling juxtapositions are not only allowed, but encouraged, and the use of rich metaphor opens up interesting and unexpected associations. KF: Well, I can DO the funky chicken, so I’ll go with that. Today I am excited to share my interview with April Halprin Wayland. I recently had the opportunity to meet April in Southern California. She was so gracious to welcome not only me but my family to her home where we met her dog and tortoise. I’m writing from the road so I will share photos with her poem for Poetry Friday. AHW: I am a very slow reader, but I just read the wonderful non-fiction picture book (an SCBWI 2013 Golden Kite winner) Noah Webster and his Words by Jeri Chase Ferris, illustrated by Vincent X. Kirsch, and two wonderful picture books by Michelle Markel: Brave Girl—Clara and the Shirtwaist Maker’s Strike of 1909, illustrated by Melissa Sweet, and The Fantastic Jungles of Henri Rousseau, illustrated by Amanda Hall. I’m in the middle of the riveting multi-award-winning non-fiction book, Bomb by Steve Sheinkin, and Desperado’s Wife—a memoir, by Amy Friedman. I drive with my friend, her dog and my dog (Eli) to The Coffee Place Which Shall Not Be Named to say hello to my friendly barristas and order a single shot soy latte with extra, extra, extra foam. Then we drive to the dog park. After the dog park, I will meditate for 30 minutes and take an exercise class. Then I run errands, have lunch, and write my daily poem and send it off to my friend Bruce Balan, who sails around the world with his wife in a trimaran. They’re in Thailand right now. Then I’ll whack away at emails, critique student picture book manuscripts for my UCLA Writer’s Program class, critique manuscripts for the folks in my critique group, work on a blog post. Finally, I write! I’m excited about a couple picture books now. AHW: The first draft, until I get to the end, at which point I mutter—I have no idea how to end this! Or—now, that’s a really corny ending. AHW: I write in our extra bedroom. It looks like a child’s playroom with light pink walls, light blue carpet, and a huge plastic shower curtain printed with a map of the world on it hanging up and dog toys in an open drawer and spilling all over the room. I write on a stand-up desk which I made by putting a pretty coffee table that I never knew what to do with on top of my desk. I love my desk. I stand on a bosu ball and bounce as I write. It feels very child-like to bounce while I’m downloading something from the internet. MsMac: You’ll see her writing space on Friday. MsMac: Please tell us about your new book, New Year at the Pier. AHW: It’s beautifully illustrated by the most highly awarded illustrator in Canada, Stéphane Jorisch. Stéphane and I have been blown away by the response our book has gotten. It won the Association of Jewish Libraries’ Sydney Taylor Book Award Gold Medal as well as other distinctions. It’s about a young boy named Izzy whose favorite part of Rosh Hashanah is Tashlich, a joyous waterside ceremony in which people apologize for their mistakes of the previous year, cleaning the slate for the new year. But there’s one mistake on Izzy’s “I’m sorry” list he’s finding especially hard to say out loud. Tashlich (celebrated in my town on September 5th this year) is one of my favorite traditions. We walk to a body of water, sing psalms, and toss pieces of stale bread into the water. Each piece of bread represents something we regret doing in the past year. Because I live near the sea, I get to toss my “mistakes” into the ocean. It’s a way of letting go, of creating a clean slate for the coming year. I’ve dragged numerous friends to our pier so they can taste the poetry of this ritual, to feel the wind, hear the gulls, experience moments of relief when they tossed each piece of bread. These moments changed me. How could I not share this in a picture book? MsMac: What do you hope readers will take away from the book? AHW: That we are all human. And perhaps they will learn how to apologize and how to forgive. Let this book help you explain to students why some of their Jewish classmates are absent for a few days in the fall…and what they may be doing. Read it in January to talk about the ways people around the world celebrate the new year. Use it with younger kids to talk about apologizing to and forgiving their friends and family. Use it to open a discussion with older kids about the Rwanda Reconciliation. I’d especially love to hear that you gave this book to someone from whom you’ve been estranged, as a way of starting a conversation, apologizing, and possibly beginning a new relationship. AHW: I’ve written a poem a day since April 2010, which changed my life; now I believe I really am a writer. Poetry seeps into me and leaks out. This can be very messy. AHW: Because it just is. you have never been in bed with a mosquito. Thank you so much for sharing your writing and reading life with us, April. Please welcome Janet Fagal today. JF: Peter Johnston’s Opening Minds about the words we should be using with children, a must read for everyone, Kylene Beers and Robert Probst’s Notice and Note about reading strategies, Taylor Mali’s The Last Time As We Are, Mary Oliver’s Evidence, Sophia’s War by Avi, Ann Martin’s A Corner of the Universe and The Lightning Thief. As you can see I am very eclectic and read a lot of books for kids, all kinds of poetry and books about how to be a better teacher. JF: Either in my den or bed! But pretty much anywhere. JF: I am in my second year of retirement after a 40 year career in teaching. So my days are open, but full. I actually write when the mood strikes or I have the time. I like to read blogs and comment there and on FB. I use FB in a professional way and find I love that aspect of it a lot. For poetry I enjoy writing late at night as long as I can sleep in the next morning. This sort of has surprised me, but I go with it. I am not fussy. I am and always have been a random soul “squooshed” into a school schedule. In retirement I am having to re-invent my routines. One might think this a grand thing, but to a “random”, life is a feast and I want to savor it all. So time can appear to stretch on forever some days. I just see and like to use time in my own way. And sometimes that means I scramble to meet deadlines! MsMac: Ooh, your retirement life sounds wonderful. i have five more years. Writing the first draft or revising? Which is your favorite? JF: I relish the hard thinking, playing and energy that goes into revising. I remember hearing educator Lucy Calkins talk about needing to be both passion hot and critic cold as a writer. Passion to get it all out and down, to feel that need to write and write some more and cold to revise and edit with care and clarity, and precision, even when you have fallen in love with your own words. That said, writing is hard work. JF: Since we are empty nesters, I like to cozy up on my couch that sits in front of a large window and write on my laptop these days. Which is something I don’t think I would have predicted a few years back. I was definitely into paper and pen. I do love the messiness of drafting on paper, but I am now speedier on the computer. I am pledging not to get left behind by technology! JF: I am working on poems for submissions to magazines. There are a couple of Haiku contest opportunities I am working toward. I like having to find the essence that Haiku demands. I am also in the earliest stages of a verse novel; I have been greatly inspired by Nikki Grimes’s latest book, “Words with Wings”. I am working on a book about my poetry teaching. And I am still considering what my own Blog might be like. JF: I teach. I tutor and substitute teach and talk to teachers about using poetry with kids. I also volunteer in classrooms in my old school bringing the love of poetry to elementary kids. 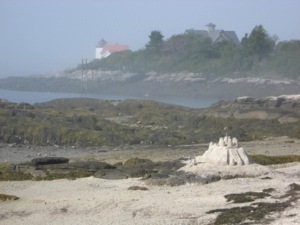 I travel to visit family and friends and look forward all year to our summertime R and R weeks in Maine. 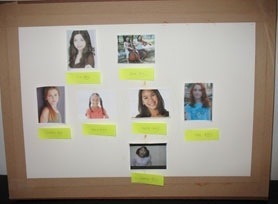 I am also on some boards. One is our local music in the schools guild, another is my Pen Women group and I am active in the New York State Reading Council in my area. I am secretary for one, co-president for another, I chair our annual poetry contest and help plan programs for the other. So I keep really busy. JF: From my earliest days, thanks to my mother, lines of verse have been a part of my life. 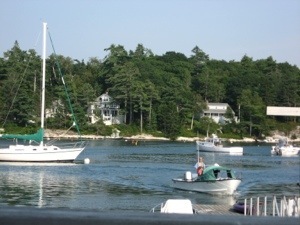 Because I grew up on Long Island and my mother lived on a beach, literally, some summers in the 1930s, “Sea Fever” by Masefield is a poem that resonates with an oceany roar from childhood. Poetry has helped me think about the world and notice more. Poetry makes me feel and helps me remember. In the last 12 years I stumbled on the joy of bringing poetry into the lives of children; so much so that I am called “the poetry teacher” in our town. My students are known for the poetry they can recite and the poems they write. Beginning in 2005 I started to learn poems by heart, too. Carrying these poems with me changed me. When I am alone or have time, I can entertain myself with words written long ago or recently and I love the connection to the poet who never knew me. I can recite for family and friends and little ones, too. And I am shocked that at my seasoned stage of life I can learn poems as easily as I do. I can’t emphasize enough how important it is to read widely and about poets and poetry. I eagerly await Lee Bennett Hopkins’ newest book, All the World’s a Stage and a poem from that book, Rebecca Kai Dotlich’s “Amazing Face” will be the next one I memorize. JF: Since I am a teacher I will talk about how I think poetry and kids go together like paddles and canoes. (I had to throw in a little poetic simile to consider!) Children love poetry. They love all kinds, if you present it in a way they can relate to. But no pressure to memorize or analyze. Just be with poetry. In school I did not make it like a lesson. I wove it in naturally and throughout the year. It was almost like a game at first, though at the same time, I built in reverence for words. And the kids knew when to be silly and have fun and when to talk about important ideas even if they might not yet fully understand. And they also developed a reverence for poets!!! Poetry is language at its finest. It grabs us, holds us, enthralls, and teaches, entertains and reaches us in ways that can take our breath away. Just like a picture is worth 10,000 words, a poem can make that picture clearer and more enduring. And the variety, ah the variety. Some thing, (many things) for everyone. I have found and believe strongly that we should never underestimate what children will be interested in or want to learn. When my 3rd graders eagerly learned “O Captain, My Captain” because they thought it was moving and important, my eyes were opened to possibility. Poetry is powerful language and thought. Like poet, Dana Gioia, I want it to be a vital part of our culture again for everyone. So dip your paddle in the poetic sea, don’t be afraid! Let yourself glide, silently at first, let it pull you along, let it transport you to where words sing siren songs. It will bring you to poetry if you let it. Let me introduce you to 3 year old Samuel. I adore how he learned this poem just as my students learn, by ear. And you can tell he “gets it” on his own level and loves it. JF: Here’s a quote I like. I have so many favorites it is hard to choose. Janet, thank you so much for sharing a bit of you poetry and writing world. Good luck on the submission process. I will have a poem by Janet to share for Poetry Friday. Today I am pleased to share my recent interview with J. Patrick Lewis, currently the Children’s Poetry Laureate. MsMac:What books are on your night stand? JPL: P.G. Wodehouse, The Code of the Woosters, Charles Causley’s Collected Poems, James Fenton’s Out of Danger, Ian MacEwan’s latest novel, Sweet Tooth, The Seashell Anthology of Great Poetry, Lewis Turco’s The New Book of Forms, which makes a nearly quotidian circuit from nightstand to study, and a glass of Chardonnay. MsMac:What was your favorite book as a child? Was poetry something you enjoyed as a child? JPL: A chair, any chair—Hepplewhite, Chesterfield, chaise longue, barber’s chair, bean bag, bar stool. A chair. JPL:Mirabile dictu, I awake each day at 3:30 AM (warped metabolism!). So I’m in my office no later than 4:30. With breaks for coffee, emails, grazing, a nap, a pedicure, extreme skateboarding, and schmoozing with my wife, I am writing, rewriting, reading, researching until c. 4 PM. I’m not particularly proud to admit that I affirm more than most William James’s adage: “Habit is the great flywheel of society.” As Donald Hall put it (counterintuitively but correctly in my view), one should save the last third of one’s life for work. All of the above apply on days that I am not visiting schools, traveling to conferences, or TLCaring for the 35 trees I’ve planted in my backyard. MsMac: love Donald Hall’s statement. Writing the first draft or revising? Which is your favorite? JPL: I spend so much time revising one continuously changing draft that it always seems like writing the first draft to me. Honestly, I can’t tell the difference. JPL: Nondescript. A crooked little room in a crooked house with a window looking out on a blue jay cannonballing the birdbath, a sparrow flirting (in vain) with a goldfinch, and Mr. and Mrs. Wren squabbling as usual . . . or a snow plow whizzing by. JPL: Make the Earth Your Companion, a lyrical book-length nature poem I am revising for Creative Editions; an ambitious ms., the tentatively-titled Voices from the March, 1963, a book of poems I am writing with my friend George Ella Lyon; my sixth book with the marvelous illustrator, Gary Kelley—James Reese Europe and the Harlem Hellfighters; and always, when time allows, the desultory adult poem or light verse. JPL: Skyping with my grandchildren in Portland, Oregon and York, England, or with my dear Russian friends of forty years in Moscow. Also, I’m about to fence the entire block with an enormous macramé I have made out of my rejection letters. The letters are twisted in such a way that you can’t see any of my naughty marginalia. MsMac: As the Children’s Poet Laureate, how has the awareness of children’s poetry been raised? What do you wish for children’s poetry? JPL: Baseball is not America’s pastime, as I’ve said so often. America’s pastime is not reading poetry. I like to think of myself as a Pied Piper for poetry—before, now, and after the laureateship. Perhaps all children’s poets who visit schools feel the same way. I don’t want children to love poetry. My objective is more modest: I want them to hate poetry less than most Americans do. If, at the end of a school day with 400-500 children, I have turned 4 or 5 heads in such a way that I have convinced them to keep poetry in their quivers for a lifetime, then I call that success. MsMac: i agree with the desire to keep poetry in their “quivers”. You had seven books published in 2012. What does it take to get that many published in one year? JPL: Paying various editors large sums of money. Seriously, the answer is a combination of hard work and dumb luck. Children’s poetry has become the demented stepchild of publishing, best kept chained in a broom closet. These days many publishers have embargoed it altogether. So seven books in one year is a mistake and a rarity, at least for me, and I’m sure it will never happen again. To state the obvious, the quantity of books one writes counts for nothing next to the quality. MsMac:Two books, Last Laughs and Twins were a collaboration with Jane Yolen. What can you share about the collaborative process? JPL: Collaboration is probably not the right word since it suggests two poetsworking together cheek by jowl, revising one poem, back and forth, until it’s as close to perfection as they can make it. I would say that what I have done with a half dozen children’s poets, including Jane and our three books, is simply “co-authorship.” We settle on a subject that appeals to both of us, then write and rewrite 8 or 9 poems each until we’ve produced what we think is a publishable ms. Sometimes, of course, we’re wrong. For the three books Jane and I have published successfully, three others have died aborning. MsMac: What do you hope readers/viewers take away? But seriously, I hope to provide them with a soupcon of entertainment in a dwindling-down day. Certainly no “message” and nothing of an “educational” nature appear in my books. Dark chocolate or milk chocolate? Either one, with almonds. Dance: funky chicken or the tango? If I were to attempt either one, it would be a personal offense to my sacroiliac. JPL: My favorite quote, like my favorite book or author, changes every 15 seconds. This 15 seconds? Thank you, Patrick. If you haven’t read his poetry books, run quick to get them. Happy reading. Come back Friday to read one of his poems.